Home Uncategorized Bar-A-Thon 3rd edition is here..!! Blog-A-Rhythm is back with Bar-A-Thon’s third edition! It is a blogger’s event that’s all about supporting creativity and the blogging community. In this blogging challenge, you will have to win a blogging marathon by blogging every alternate days. 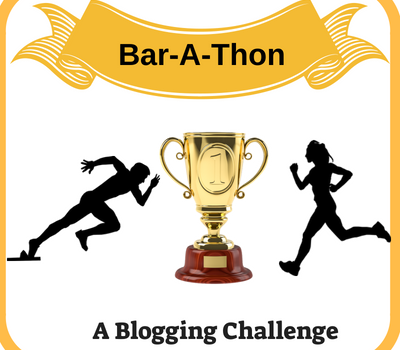 A theme is assigned in every Bar-A-Thon and bloggers need to blog about that specific theme throughout. I can’t wait to start blogging and read what my fellow bloggers are going to write as a part of this marathon. If you also wish to participate in Bar-A-Thon this year, you need to know a few things. This year Bar-A-Thon will be conducted from 2nd July, 2018 to 15th July, 2018 and the theme is Run/ Sprint/ Marathon/ Dash/ Chase. It does not have to be about fitness and you can write about any kind of marathon- movie marathon, food marathon etc. July 11th: Give me Five! To start, you need to visit this link and download the badge you see at the top of the page. Upload this badge on your blog to mark yourself as a participant. In the same page, you will also find a linky at the bottom where you can sign up for this challenge. You also need to share the page on all social media pages. You need to write on the givenprompts every alternate day. Apart from all this fun writing, you also need to visit at least 2-3 blogs. This is also a great way to support fellow bloggers. If you are sharing your blogs on Twitter, do not forget to use#BarAThon and tag @blogarhythm1. This can earn you a retweet from @blogarhythm1. The participants who write about all the prompts and follow the instructions diligently will win the winner’s badge.